What also happens after the first several days is that our bodies go into a state called ketosis. 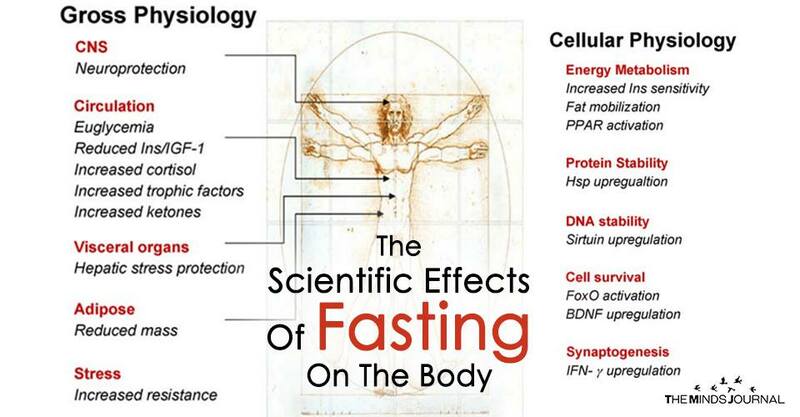 This is one of the most important factors in fasting. Ketosis is when your metabolism switches to using mostly fat for energy, rather than carbohydrates and glucose. This is why the subjects in the Minnesota experiment had very little energy and found themselves becoming very sluggish. They were eating just enough to keep their bodies out of ketosis, so they were unable to use their body fat for energy. When you restrict calories, your insulin levels drop drastically and your metabolism slows down, leaving you feeling tired and hungry. On the other hand, when you cut out food entirely, your metabolism actually speeds up, and allows you to maintain a normal level of energy in your body! Fasting can be an amazing practice, however, for many, it can be difficult to get started. Mark Mattson recommends trying one of two possible ways to begin fasting that’s gentle for most people who want to give it a try. The first system is called the 5:2 diet, which limits your caloric intake to 500 calories, two days a week. We typically eat around 2,000 calories a day, so this is a substantial reduction. This would equate to 1000 calories a week, but splitting it up into two meals gives your body time in between to reach ketosis. As opposed to splitting it up daily and eating 145 calories or so a day, which as we discussed above would result in exhaustion and much more hunger pains. Drinking water fasting other way is what we’re calling “window eating”, which is the purposeful timing of your meals so that you eat in an eight-hour window of time, giving your body enough time to exhaust its levels of glycogen and start producing ketones. You can extend this practice a bit longer, and give yourself a small window of time to eat every day, reducing your daily meal count from 3+ meals to 1 meal over several hours, and then be fasting roughly between 18 to 22 hours every day. This was discussed in this video and the amazing benefits of doing so. However, as our bodies take anywhere from two to seven days to get fully into a state of ketosis, this practice may still result in feeling sluggish or being really hungry still. There is also the remarkable dietary practice of the people of the Okinawa island in Japan. The people here have some of the highest longevity rates in the world, with women expected to live up to an average of 90 years old. They call this diet the Hara Hachi Bu, a practice of eating until you’re only 80% full and then stopping. This has been shown to reduce cardiovascular risks, diabetes, help with weight loss and increase longevity. There are many different types of fasts, from strict water fasts, juice fasts, general liquid fasts with teas and tinctures, the Ramadan fast, or even dry fasting which is no liquid or food at all.